Wycombe's pre-season friendlies against Nottingham Forest on Wednesday 28th July and Peterborough United on Saturday 31st July went ahead as planned after the entire squad were given the OK following the health scare last week. Reserve line-ups also played at Thame United on Tuesday (27th July), Hayes (Friday 30th July) and Aylesbury United (Wednesday 4th August) prior to the start of the Football League season on Saturday 7th August at home to Burnley. A health scare at Wycombe caused the planned trip to play Bohemian's of Dublin to be cancelled and put the other pre-season friendlies in doubt. The shock news was announced early on Friday morning (23rd July) when it was reported that a Wycombe player had a non-life threatening form of meningitis and that six other players had reported other minor health problems. On the advice of the Club Doctor the trip was cancelled. It was later confirmed that the player affected was Alan Beeton but after spending time at Watford General Hospital thankfully he was due to be allowed home on Tuesday. The rest of the squad were ordered to stay at home for a 48 hour incubation period but everyone has now been given the all clear. The remaining friendlies will now go ahead as planned and the Club insist there is no danger to public safety. Beeton has been told that it will be three weeks before he can start training again but has been told by doctors that it should not affect his profession. Manager Lawrie Sanchez told the Midweek Free Press "We're getting back to normal after a traumatic weekend. It's been frightening for all the lads. The important thing is that Beeton's going to be OK. Lucikly they diagnosed it early." Beeton played a full ninety minutes in Wycombe's pre-season friendly at Marlow last Tuesday (20th July) but then reported a severe headache while travelling to the following nights friendly at Oxford City. By Thursday afternoon Beeton had been admitted to Watford General Hospital where he was put on antibiotics and placed in an isolation ward. The decision to cancel the Dublin trip was made in the early hours of Friday morning leaving many of the travelling fans unaware of the news until they had reached Dublin. The cancellation of the friendly with Bohemian came too late to stop many of planned trips by Wycombe supporters to Dublin. Parties from both the Official and Independent Supporters Clubs still went ahead with their trips and the Chairboys on the Net team were actually in Dublin when the news broke on Friday morning. Unfortunately for some the first they knew that the game was off was when they arrived at Dalymount Park on Saturday afternoon to pick up the coach to take them to the AUL complex on the outskirts of Dublin. One fan had travelled down from Aberdeen via Belfast to see the game while others had also arrived from destinations other than Wycombe and had consequently not picked up the news via local outlets. We would estimate that at least sixty Wycombe fans were over in Dublin for the weekend but everyone we saw seemed to be having a good time. Special report from Dublin via this link. Lawrie Sanchez has had his six-match touch-line ban confirmed by the FA. The Club appealed against the ban given to Sanchez following an incident in his first away game in charge at the match with Preston last February. Sanchez is said to be "gobsmacked" by the decision. The pre-season friendlies got underway this week with midweek trips to Marlow (Tuesday 20th July) and Oxford City (Wednesday 21st July). 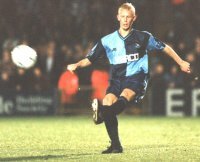 The game at Marlow saw a Wycombe reserve side win 1-0 while the following evening a full strength Wycombe side came through 3-0 with all the goals coming in the last 20 minutes. Match reports via this link>>>>. With nearly 3 weeks still to go before the start of the season the Club has already set a new all time record for season ticket receipts. The previous record of £371,000 was exceeded last Friday during the highly successful launch of the new Wycombe Racers Club at Adams Park at the Open Day. If the Club can exceed its budget of £420,000 for the 1999/2000 season this should provide spare funds for Blues Manager Lawrie Sanchez. The Club have already issued more season tickets than it did during the whole of last season and hopes to hit Lawrie Sanchez's target of 3,000 by the start of the season. Season Ticket prices here. Lawrie Sanchez revealed at the Club's Open Evening on Friday (16th July) that he has been negotiating a new contract with Wycombe over the summer and is close to announcing a new three year deal. Sanchez and Chairman Ivor Beeks meet soon after the Lincoln game to discuss the deal and an announcement is expected soon. Sanchez said that Wycombe would be aiming to consolidate in Division Two this season, with the 'three year plan' to reach Division One. Wycombe announced their first signing of the season on Friday (16th July) when a five foot wooden Red Indian turned up for the annual team-photo shoot. 'Comanche' was obtained by Terry Gibson after the players spotted the figure in craft shop on the way to the game at Lincoln in May. Apparently Terry Evans had become well none for using the 'Comanche' catch phrase and the team decided to buy the figure on the return journey from Sincil Bank. The extended celebrations at Lincoln meant that the shop was closed by the time the team returned but 'Gibbo' spent the summer tracking the shop down and the alternative team mascot was eventually delivered on the first day of training. The bizarre inclusion in the team-photo was enough to make the back page of national tabloid on Saturday. Expect more appearances throughout the season. The question on the fans lips at the moment, however, is who's the tallest, Gibbo or Comanche? The Club held its third ever Open Day on Friday (16th July), giving fans a chance to look behind the scenes at Adams Park, meet Club staff and get their last chance to buy a season ticket at the special discounted rate. The event ran from 5pm to 9pm and included several interviews with players and finally at just after 8.00pm, Manager Lawrie Sanchez. The players and staff seemed in a very upbeat mood with everyone keen to get stuck into the new season. It is estimated that well over 1,000 fans took the chance for a early visit to Adams Park. The Club were delighted that the Bucks Free Press were the Official Event Sponsors for the Open Day and that Hotwheels launched their exclusive sponsorship of the Wycombe Racers Club & the Baby Blues at Adams Park (see below). With nearly a month still to go before the start of the season the Club says it is "highly confident" it will exceed its target and set a new record for season ticket sales, both in terms of income received (previous record was £371,000) and actual numbers of season ticket holders (previous record around 2,800). Maximum discounted season tickets are only available for purchase before this Friday (16th July) from Wanderers in Town (before 5.15pm) and from Adams Park (before 8.45pm the same day). Fans can also call the Creditcard Hotline on (01494) 441118 (Monday - Friday 9.15am-5.15pm). The Official Junior Blues Supporters Club for 3-15 year olds is being re-launched at the Open Day at Adams Park on Friday 16 July as the Wycombe Racers Sponsored by Hotwheels . All 1999/2000 Members (existing or new) will receive a FREE Hotwheels Vehicle, a FREE Exclusive Wycombe Racers Baseball Cap, FREE Admission (with a friend) to an Exclusive Wycombe Racers Millennium Party at Adams Park on Wednesday 29 December 1999 plus lots of other exciting new benefits. To join the Wycombe Racers costs the same as to join the Junior Blues. Membership is as little as £23 and includes a 1999/2000 WWFC season ticket in the Hypnos Family Enclosure or Syan Stand. Wycombe have announced the following squad numbers for next season. Lawrie Sanchez has said there's "nothing to be read into the numbers". The players were asked to pick a number between 1 and 11 and then another between another between 12 and 30. Lawrie Sanchez's target of having a record number of season ticket holders is still very much on as the Club has already taken over £300,000 in advance season ticket receipts with 25% of those buyers being new applicants from last season. Maximum discounted season tickets can be bought up to 8.45pm on Friday 16th July 1999. Jason Cousins will probably miss the pre-season trip to Ireland after failing to recover from his twisted ankle picked up when he scored against Bristol Rovers back in March of last season. Cousins is currently having treatment at Lilleshall and may be out for the league opener against Burnley. The annual review of the season video is now out and as expected draws much of its material from the last few weeks of the season. 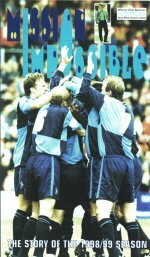 Running in at 1 hour and 43 minutes all the Wycombe goals for the 1998/99 season are featured, including the pre-season friendlies and cup games. Much of the footage is taken from the Nationwide Highlights programme with an occasional piece of 'in-house' commentary added for good measure. Once you've lived through the cheesey intro you'll find that Neil Smillie is 'sacked' just 35 minutes into the production with Lawrie Sanchez appointed within a couple of minutes (if only it was that quick!) The Man City game at Maine Road is dedicated 10 minutes of coverage with the final game at Lincoln commanding 15 minutes. The run-in to the season is interspersed with an 'after season' interview with Lawrie Sanchez which just about justifies the £14.99 price tag. From a quality point of view, camera work and picture transfer are excellent although some of the editing leaves a bit to be desired, as does the sound quality but for a complete record of the season in one package, plus the chance to relive Lincoln again and again, it's a must for every Wycombe nut. Available now from Wanderers in Town. The start of the new season is now just over month away with the first friendlies starting in two weeks time. Still no news of any new signings but an unusual story in last week's Bucks Free Press revealed that former Blackburn and Aberdeen striker Mike Newell was being tracked by Lawrie Sanchez. The 34 year old Scouser ended up signing for Conference side Doncaster Rovers after his wife failed to pass on a telephone message in time. Sanchez seemed disappointed in missing out on the 6 foot target man and may now opt for the current forward line plus newly created forward Paul Emblen. The squad starting training this week at RAF Halton minus expected guest Daley Thompson. Thompson had to pull out due to commitments at Wimbledon (Football Club that is, not the Tennis). Wycombe Wanderers Youth Team fly out to Norway this week to play in a pre-season tournament. They will play Youth Team Manager Gary Goodchild's former club Viking Stavanger as well as Lillestrom and Start. The 20 strong squad will include First Team fringe members Danny Senda and Martyn Lee. Lawrie Sanchez has been banned from the touchline by the FA for the opening six games of the 1999/2000 season. The ban, which includes a £500 fine, is a result of his outburst during his first away game in charge for Wycombe at Preston last February. Wycombe were also due to appear before an FA hearing on Friday (2nd July) to explain the staggering 508 disciplinary points accumulated last season. Steve Brown (surprise, surprise) was the worst offender with 74 points, followed by Michael Simpson (46) and Matt Lawrence (44). Chairman Ivor and Manager Lawrie were last seen on Friday's 10.10 train heading for Marylebone to explain Wycombe's case. Wycombe have announced four changes to the previously published fixture list, with a further controversial fifth proposed. The home game with Wrexham on Bank Holiday Monday 30th August has been moved to the next day (kick-off 7.45pm); the away game at Bristol City originally scheduled for Saturday 18th December has been brought to the Friday evening (the game is not on Sky); the away game with Colchester United will now take place on Wednesday 29th December instead of the previous day and finally the away game with Cardiff City planned for Saturday 4th March has been moved to the Friday to avoid a clash with a rugby international. The proposed fifth change by Wycombe is to move the home game with Notts County on Saturday 22nd April to Thursday 20th April. This idea stems back to last season when Gillingham pulled a similar stunt and gained two extra days rest prior to playing Wycombe. Ex-Wycombe striker Steve McGavin has joined relegated Northampton Town on a free transfer from Southend United. 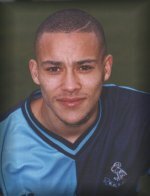 McGavin left Wycombe in controversial circumstances back in January 1999 after allegedly being told that he didn't have a future at Wycombe. While at Southend, McGavin also made appearances for West Ham's reserve side but a long term foot injury has hindered his career in recent times. Bohemians Unofficial Website - Reasonably up to date and has some pictures of the ground. Bohemian are currently building a new stand although it may not be open by the time Wycombe visit. General Dublin Website - A very extensive website with maps, live cams, virtual tours, accommodation details and just about anything you ever wanted to know about Dublin. Former Wycombe 'keeper Paul Hyde is to take up a coaching position at Conference side Dover Athletic. 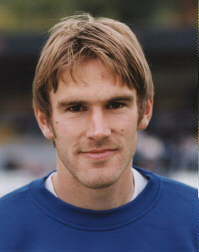 'Hydey' had to retire from the game when he broke his leg while playing for Leyton Orient in January 1998. He teams up with Dover's new Assistant Manager Clive Walker who has moved on from newly promoted Cheltenham Town.